Fontvieille is a small town in the Alpilles Natural Regional Park between Arles and Les Baux-de-Provence in the Bouches-du-Rhone department of Provence. Although without a great deal of fascinating monuments or notable sights of its own, Fontvieille is a pleasant town with a small historic centre and merits a visit when you are passing through. 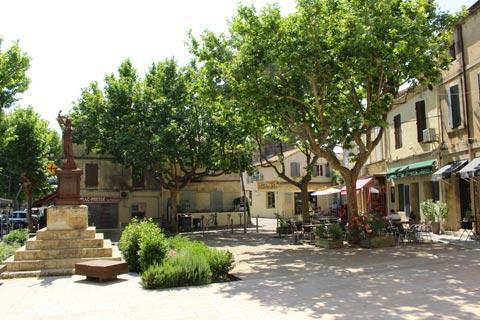 Quick and easy to explore, Fontvielle has a pleasant main street and square, on which you will find a church and a cafe with a shady terrace on its edges. The church was built at the end of the 18th century on the site of a church that had stod here since 1695. The clocktower was rebuilt in 1867 and the altar was replaced in 1876. 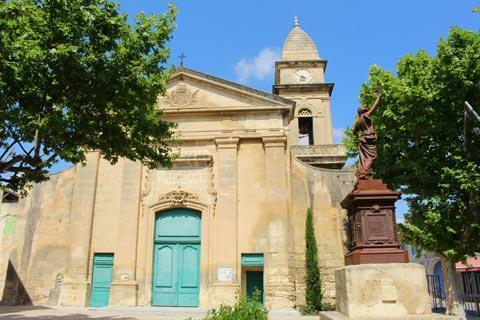 In front of the the Church of Saint-Pierre-ès-Liens you can see a statue of Marianne, erected on 1 June 1889 to celebrate the centenary of the revolution. 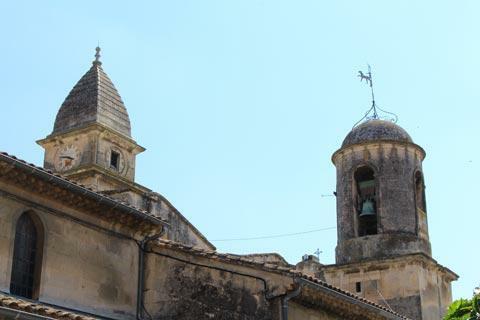 There is a small historic centre to Fontvieille behind the chuch with some traditional Provencal houses. 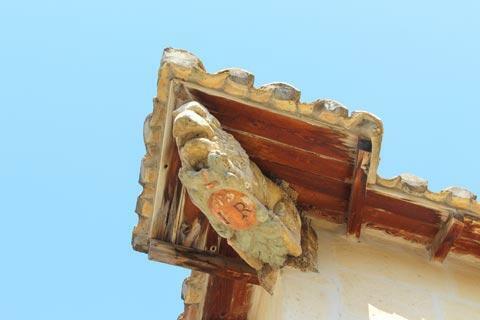 One of the most interesting, in Rue Fallabréguier, has a lion carved in wood as part of its roof structure. Behind the town-hall there is a small monument to three partisans shot at that spot during the Second World War. The monument is perhaps unexceptional, although pretty when I visited because it happened to be surrounded by poppies in flower, but interesting because although there are very many war memorials in France, they are usually to those who died far away, and to be stood in the actual spot where people had been shot for defending their country is very moving. 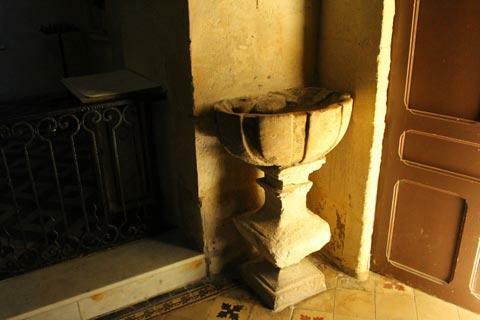 Continuing up the hill behind the monument a walk is available to enable you to enjoy the countryside around Fontvieille and discover the 19th century Provencal writer called Daudet. The 19th century Moulin d'Alphonse Daudet is on the hill above the village and was the inspiration for Daudet when he wrote 'Letters from my Windmill' - a sort of 19th century 'Year in Provence' (a well known book by Peter Mayle who writes about life in Provence) look at the lives of everyday people in the region. There is also a small museum here that provides information about Daudet. The walk continues past several other mills and the Chateau Montauban, where the writer lived for several years. At the aquaduct and mills at Barbegal close to Fontvieille you can see the ruins of two aquaducts and a mill dating from the roman era. The substantial ruins of 10th century Montmajour Abbey are in a pretty location along the road to Arles, and have cloisters and a crypt to enjoy, as well as the possibility to climb the keep for some excellent views. 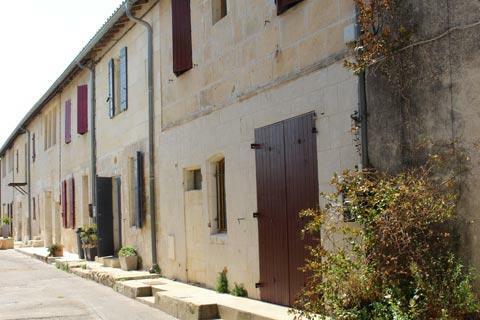 Arles is to the south-west of here and the charming village of Les-Baux-de-Provence is to the north-east of Fontvieille, and there are many other of the well known sites of western Provence close by including Nimes, Pont du Gard and Avignon.